Let's Spread Awareness of Tube Feeding! Do you want to help us Spread Awareness? Here are just a few ideas to get started. Check out our Social Media page for lots of ideas! We have approved profile pictures and cover images you can use on social media. Download them from our Downloads page. A number of parents have gotten local TV and print coverage featuring children who are tube fed for Feeding Tube Awareness Week®. Go to How to Contact the Media for more information. Share Feeding Tube Awareness Week® materials with your doctors, nurses, and other medical professionals. Click to download the following helpful materials. Making an awareness video is a great way to share your story and spread awareness. This tutorial shares great tips for making your own awareness video that you can share with friends, family on social media and even with news media. Share your experiences with tube feeding with your local school! This guide offers a sample letter to the teacher/school and a presentation outline to inspire your customized presentation! In 2011, we launched t-shirts, hoodie sweatshirts and buttons featuring our logo, with our merchandise partner 3E Love. Overwhelmingly, these items have created opportunities to raise awareness, educate and gain support and acceptance. Thousands of items have been sold worldwide. A portion of the proceeds go to the Feeding Tube Awareness Foundation. Wear them all week long! 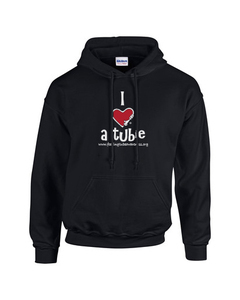 Visit our Feeding Tube Awareness Store. Host an Event to Share with Your Family, Friends, Religious Organization, or Community! Host a friends and family gathering, get together with local tube feeding families, hold a rally, or hold a fundraiser. Our Family and Friends Guidebook can help family and friends to understand. Ask your city, state, county, or country to issue a Proclamation declaring the second week of February Feeding Tube Awareness Week®. Contact them at least a month in advance, and share materials from our Communication Materials page. Submit your Proclamation as an Event so we can add it to the website. A growing number of individuals have had our logo tattooed. Check out our gallery of Tubie Love Ink! Not ready for a permanent tattoo? Try out a temporary tattoo, available at Our Store. Help use Feeding Tube Awareness Week® to show your support of the positive benefits of enteral nutrition and communicate it to your members and followers. The Feeding Tube Awareness Foundation is happy to discuss ways in which the organization can help support your efforts. For more ways you can use Feeding Tube Awareness Week® to raise awareness, please visit our page for Non-Profits. The Feeding Tube Awareness Foundation is happy to discuss ways in which the organization can help support your efforts. Please consider becoming a Sponsor. We are able to provide Parent Guides and Awareness Buttons to sponsoring organizations. Please feel free to Contact Us. For more ways you can use Feeding Tube Awareness Week® to raise awareness, please visit our page for Corporations and Businesses. The Feeding Tube Awareness Foundation appreciates the support of small businesses. Your products have come from a personal need and the community benefits from that. Please go to our page for Small Businesses for some suggestions on other things you can do to help raise positive awareness. Visit the Feeding Tube Awareness Foundation's website and download our Parent Guide or Friends and Family Guide.